Marimo balls are a species of green algae that are found in lakes in the northern hemisphere. The name Marimo was coined by a Japanese botanist Takiya Kawakami in 1898. Mari means bouncy play ball and Mo is a general term for water plants. Marimo balls were so popular until it was designated as a national treasure in Japan in 1921! So, what makes a Marimo ball so popular in many households? 1. They make cute decor! The tiny green balls are so cute that it makes a nice and simple home décor, even for small houses. Other than putting it on a shelf or a table, it can even be kept inside fish tanks as aquarium plants. 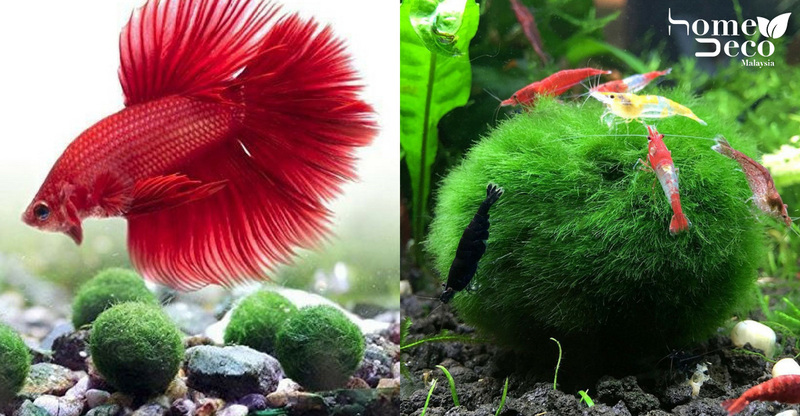 Marimo balls also act as toys for the fishes but not to worry though, a Marimo ball is nearly indestructible! Marimo balls just need tap water, some light and a source of food. They also live for a long time. The oldest living Marimo ball is said to be over 200 years old! To clean or to perk it up, just place the balls in a clean bowl of water and squeeze gently to remove dirt. The balls can be reshaped after being squeezed. If the Marimo balls are kept in the aquarium, they help reduce the number of nitrates for the fishes. Nitrates come from fish waste and too much of it isn’t good for the fishes. Marimo balls absorb nitrates as food so it’s pretty much a self-sustaining plant! Ever tried to rear fish in a bowl and it suddenly dies? Put in some Marimo balls to oxygenate the water! Marimo balls release oxygen and take in carbon dioxide. A win-win for the fish and Marimo ball. Keeping Marimo balls is also a good way to introduce kids how the ecosystem works. Due to its low maintenance, Marimo balls make great gifts too. It’s also a good send-away gift for those who are moving out to college or university and they can bring something from home along. Having a low maintenance plant can liven up any space.